1951. Allard P1 Sports. Reg No: MLW 872. 1954. Allard Palm Beach. Exhibit at the Atwell-Wilson Motor Museum. March 1972. 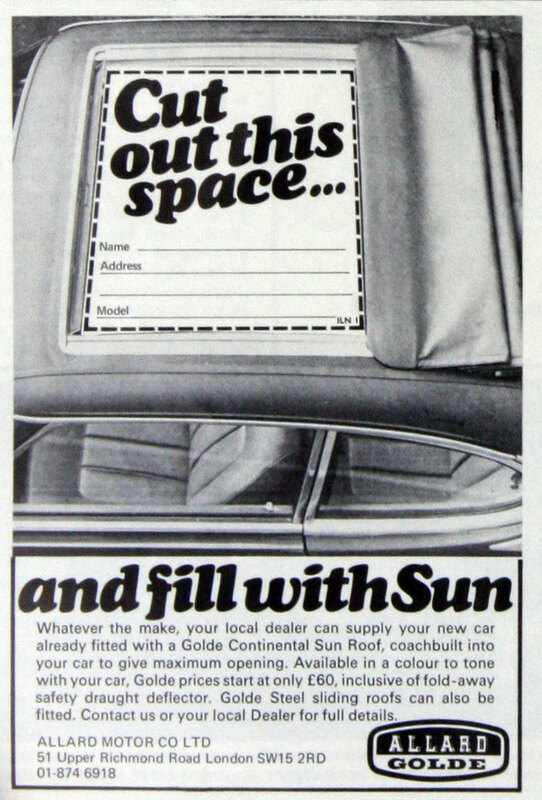 Allard Golde sun roof. 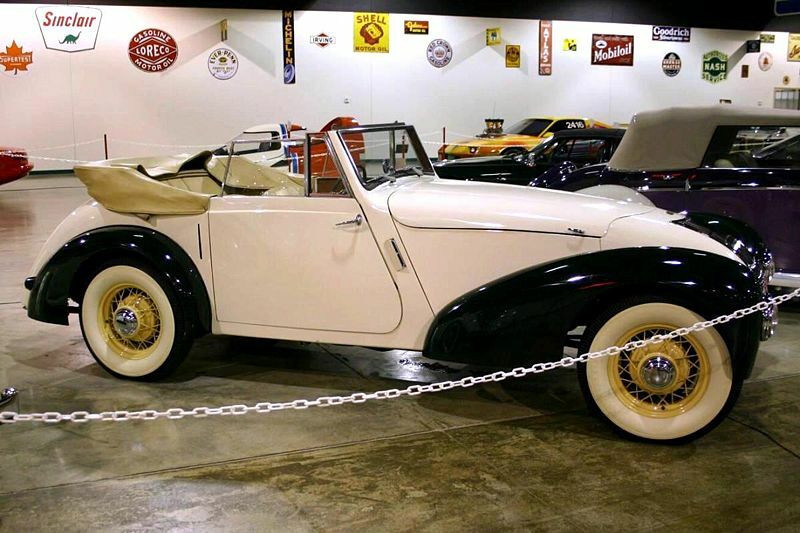 The Allard Motor Company was an English car manufacturer founded by Sydney Allard. In 1935 Allard created his first Allard Special, a Bugatti-tailed two-seater which won its first event at Taunton. 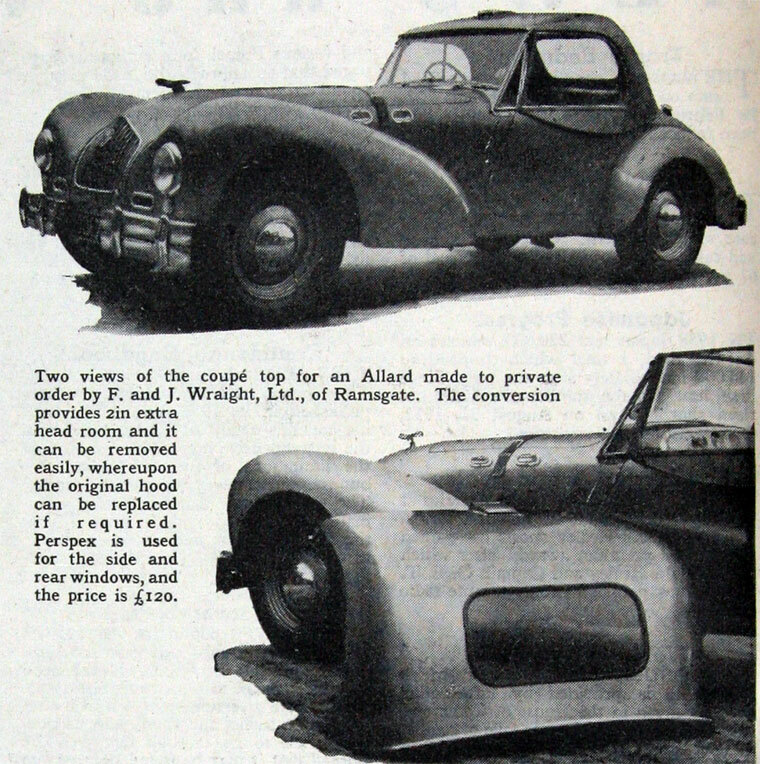 Allard then began to build replicas for sale. The Allard Motor Company was founded in 1945 in Clapham, London, and produced approximately 1900 cars until its closure in 1966. 1935 The first Allard cars were built specifically to compete in Trials events - timed events somewhat like rallies but through much worse terrain, almost impassable by wheeled vehicle. The first Allard mounted a Ford flat-head V8 in a body mostly sourced from a Bugatti racing car, and used the American engine's high torque to great effect in this slow-speed competition. 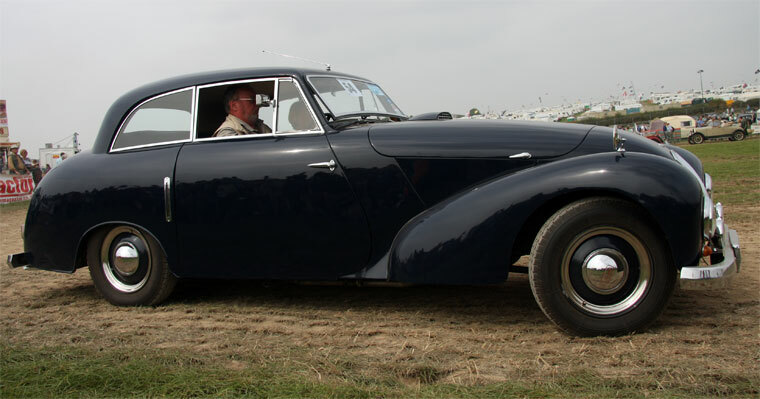 Further Allards were soon built, all specially ordered, and fitted with a variety of large, Ford-sourced engines, including Lincoln-Zephyr V12 power-plants. 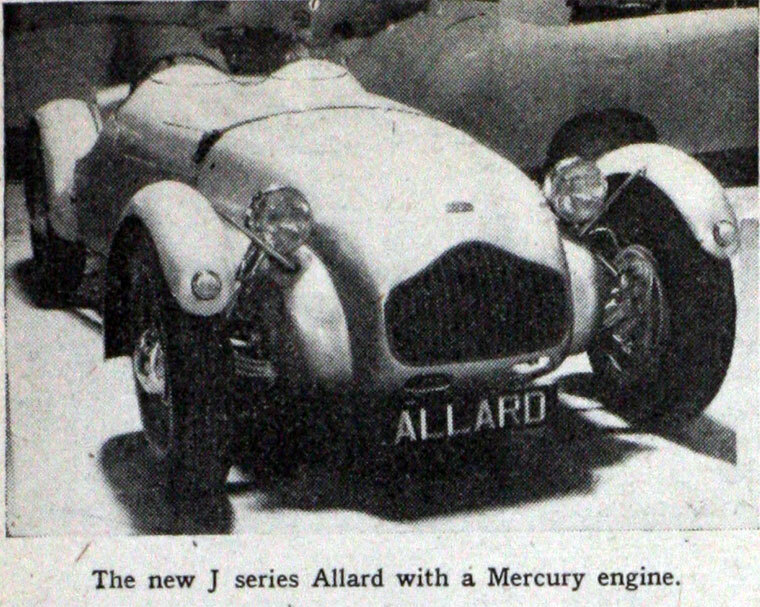 By 1939 and the outbreak of war, twelve Allard Specials had been built, and Sydney Allard planned volume production, but the war forced a delay to those plans. Post-WWII: Allard's company had worked on Ford-based trucks during the war years and, when hostilities ceased, Allard had built up quite an inventory of Ford parts. 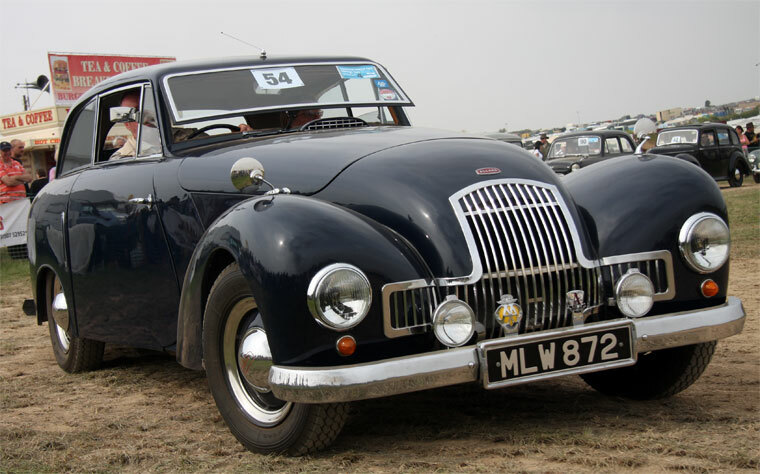 Using these, and bodywork of Allard's own design, three postwar models were introduced: the J, a competition sports car; the K, a slightly larger car intended for road use, and the L, with four seats. All used primarily Ford mechanicals, making them easy to maintain anywhere. Sales were fairly brisk for a low-volume car, and demand was high for cars in general; Allard introduced several larger models, the M and N.
Sydney Allard saw the potential of the US market, in much better shape financially and rather lacking in quality sports cars. A special model intended for the American market was soon produced, the J2, fitted with a new independent rear suspension. They were available with a huge choice of different American engines, including a new Cadillac V8, much more powerful than the Ford units used before. Importing American engines just to ship them back across the Atlantic proved troublesome, so soon US-bound Allards were shipped engineless and fitted out in the States. They proved phenomenally successful, and the American mechanicals meant that unlike more exotic British sport scars, they were familiar beasts for mechanics to work on. They were used to great effect in competition on both sides of the Atlantic, including a third place at Le Mans in 1950 and first place in the Monte Carlo Rally in 1952 (driven by Sydney Allard himself). 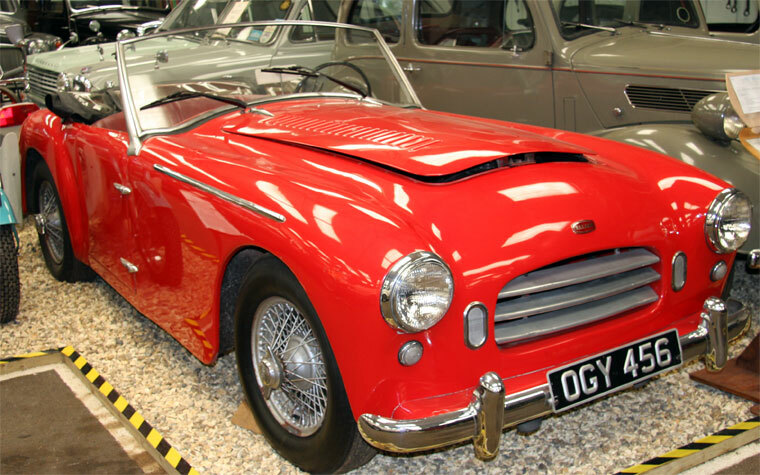 1953 A rather bizarre model was the 1953 Allard Clipper that was hoped would cash in on the microcar market. This tiny car with glass fibre body was powered by a rear mounted 346 cc Villiers twin cylinder motorcycle engine and claimed to seat three people abreast with room for two children in an optional dickey seat. About 20 were made. 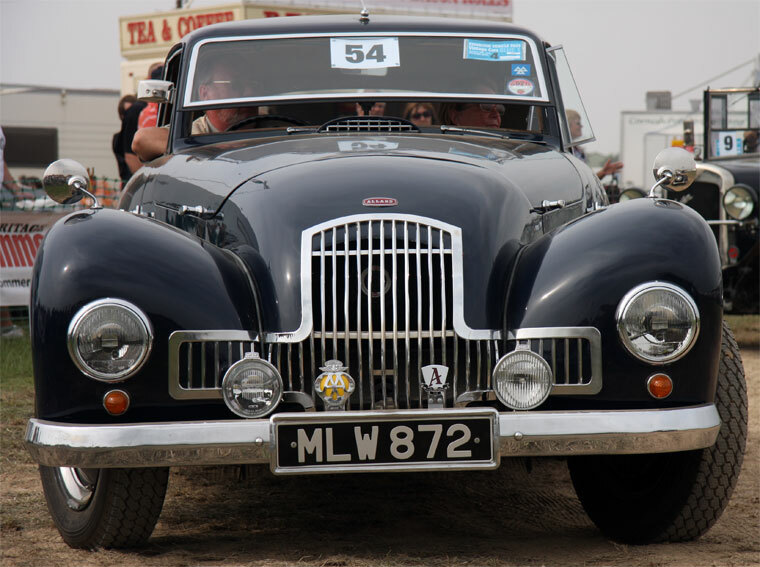 By the mid fifties Allard was struggling as a manufacturer. Its attempt to give Dodge dealers a Corvette competitor using a re-bodied Palm Beach with a Dodge Hemi engine were hit by the recession in the US economy in the late Fifties, and Allard produced few cars after 1959, and those only to special order. Sixties Allards were simply performance modified British Ford Anglias marketed as the Allardette 105, 109, and 116. Everything ended in 1966 when Sydney Allard died; on the same night, a fire destroyed the factory and most Allard company records. 1991 The Allard name was bought by a new company in 1991 but production never started. In 1994 a new version of the J2 were made by Allard Replicas of Harpenden, Hertfordshire in either kit or assembled versions with full agreement with the trademark holders. Production ceased in 1997. See Allard and Co for information on a company of similar name producing motorcycles. This page was last edited on 24 July 2017, at 09:26.